Choose the type of directory you will launch. 1. Choose the type of directory you will launch. The great thing is, a directory website can be launched for almost any industry or purpose with an opportunity for members to add all kinds of great content like videos, articles, special deals, and photo galleries. There are several types of online directories that you can choose to create. The most common ones are local business directories, professional service provider directories, and membership directories or association websites. To make it easier, you can start in the area that you have the most experience in or the location where you are residing. For example, if your city does not have a strong local business or tourism guide, you have a good opportunity to create an online community that generates recurring revenue. If you are a special service provider, you can create a directory for your industry, starting with you and your colleagues and ultimately making some money from your competitors while featuring your business at the same time. Or perhaps choose an interest or topic that you are passionate about and create a national or international directory website or membership community around that. There’s room for a lot of innovation with the online directory business plan. There are several different approaches here. You can, for example, hire a developer and a web designer to build your own directory script, yet the chances are they will most likely use an inexpensive off-the-shelf product that they charge you a lot of money to maintain. Worse yet, they disappear or get a bigger job and you’re left behind with a directory solution you can’t use. Another approach is that can go with a low-cost high-maintenance option like a WordPress directory theme and WordPress directory plug-in. They still require you have someone with technical knowledge on your payroll to maintain. Also, the difficulty to build a directory with WordPress is that WordPress was not built for directories, it was made for publishing blogs, so you’ll have to invest a lot of time patching various components together and it is not best-suited to scale for a powerful directory solution. With eDirectory you can create your professional directory website quickly and easily. The monthly plans make it affordable to start quickly with all the essential features for a successful directory website right where you need them so you can focus on the directory business plan rather than back-end maintenance. A directory website is really just a large amount of information (business listings or member profiles) that is highly organized for visitors to search, browse, and connect. With top-levels and perhaps various sub-levels of categories for visitors to search through, online directory websites allow users to find what they are looking for quickly and easily. If you need general business categories, eDirectory will provide them free of charge. You can also add them manually. 25 top-level categories with an average 10 sub-levels for each is generally sufficient, yet with eDirectory you can go down to 5 sub-sub levels for a very granular search experience. Your members or business listing owners can also be charged to appear in more categories, which in essence creates more visibility and this impressions and conversion. This is another great way to build a “ladder” with your pricing levels to encourage the sales of your most premium membership level, by limiting the number of categories your directory website listing owners will appear in. Early on the name of the game is to get people joining your online community website, so a Free membership level is highly recommended. Free members add a ton of value early on as they will contribute content (although limited), provide invaluable feedback, share their listing to their social media, and may upgrade to a paid listing down the road if you really give them some quality attention from the beginning. With setting up the remainder of your pricing levels, make sure to have the top level get everything under the sun to really encourage purchase, even do some promotional discounts on the first 100 paid sign-ups with 20-50% off, perhaps even free banner ads for a month or two. With the pricing level(s) in the middle, make sure they get enough to warrant the price they’re paying for yet to limit or restrict the most valuable directory website features, so maybe they can only add 1 special “deal” to your deals engine for example. Do some testing knowing that nothing is set in stone and that you can adapt your directory website pricing and update your directory business plan as you learn and grow. If you have a list of business or members to import, that’s great! With the eDirectory.com directory solution all you need to do is use the import template and you’re ready to go. You can also add a few listings manually for businesses or members you hope will join. Start including several listings and gradually add more. You can start with a goal to include, for example, 10 listings per day. Once members join, encourage them to share their listings to social media to gain more visibility to your directory website. As your online community starts to grow and get noticed by people, they will come to you and create their own listings by themselves. Until you reach that point, you need to assert by yourself or hire someone to do it for you, if you plan to scrape a few public sites for example. In this other blog post, we shared a few other marketing ideas as well. Publishing and curating high-quality content is an important factor to bring new and qualified visitors to your site. If you have a local directory, talk about what makes that local directory business unique and highlight its qualities. Think about what type of content would be useful to your readers and write it down, schedule based on priority, and get started with a content-creation schedule for your directory website that you are comfortable with, like 1-2 hours per week for example. You can also invite and encourage contributors and members to add content to your online community website. If you have an online directory website for specialized dentists for example, they usually will be happy to contribute valuable content to your directory solution so they can start to be seen as authority on that subject, showcase their practice, and help visitors get to know them a bit better before making the connection; all of which helps bring them more views and traffic. * How can I make my directory website so appealing that members will visit and want to join my online community and contribute content as a paying member? Take the lead! Build a directory website you would want to join. With our easy directory software at eDirectory, you can get started right away on adding all kinds of great content like blog posts, articles, industry or local events, even classified ads that can be used for all kinds of purposes like jobs, business opportunities, and even products to be showcased on your directory website. * How can I make sure that the listings have enough depth to ensure a high utilization for directory website visitors? Listings with just title and phone number are less attractive and useful than listings with photos, videos, maps, deals, classifieds, and descriptions. Invite every new member to create content, talk about their mission/vision, and share a video about themselves and what they do. * How can I monetize my directory? Online directory websites have many ways of generating revenue, which really adds to your directory business plan. The model is so successful because once you have a large captive audience, it creates many more opportunities to generate revenue like with membership dues every month or year, leads you sell to your members, affiliate links to other ecommerce products or services, banner ads you sell to publishers and members, sponsored social media posts, donations, and you can also connect a storefront to your online directory website with the new eDirectory Storefront MOD. * What type of content will bring more visitors? There are always opportunities for content creation with a potential to bring a lot of visitors to your website. Find out who the other players in your industry are as far as direct and indirect competitors, complimentary service providers, industry publications, forums, portals, and even social media groups. Get inspired by what works well for others and even what may NOT work well for your brand or community (sometimes it makes things a lot easier to get started when you at least know what to focus on). Treat every new member and newsletter subscriber early on as GOLD! Ask them what they’d like to see available to them on your site as far as any new features or functionalities. Try to truly identify what your niche can be with this as well. You will learn this by making an effort to connect and ask questions. You may be surprised by what you learn and it could create new opportunities for your online directory website. As you start to grow the directory website builder in you, you might find it useful to add a Community Forum, or integrate with services like Infusionsoft or Salesforce, or perhaps connect an eDirectory storefront in the MOD Store. All these services can provide the perfect environment for grow your business. 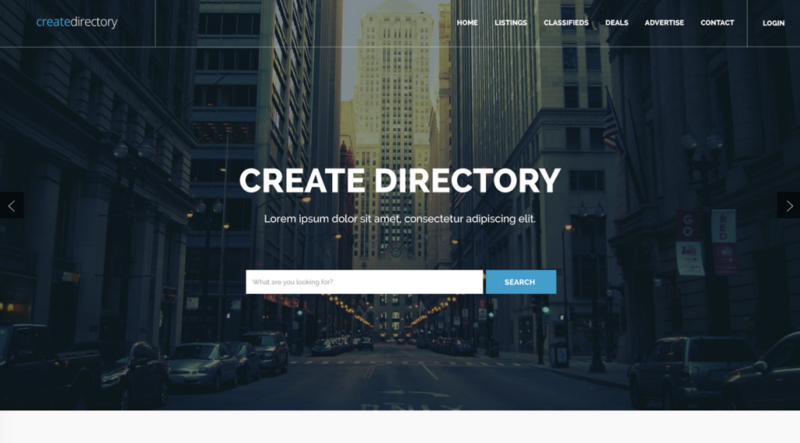 These are a few tips to help you to create a directory website. Contact us if you have any question and we will make sure you have a dedicated account executive to answer all your important questions before getting started.